Nobody has been more surprised about the astounding growth of Crappie.com, which today bills itself as “America’s Crappie Community”, than founder and owner Ed Moes. After spending quite a few hours on the home page and the various forums. I understand why it has grown so. It’s a great site with loads of good information, just for the white perch angler (Sorry Ed, but this is north Louisiana!) There are special reader forums for Louisiana and for Arkansas, too, by the way. Ed and his readers frequently send others to lakedarbonnelife.com for the latest from our area. by the way, if you are a crappie.com member or fan, we’d also love to hear from you in our comments section. Crappie.com has hit the big time and it is still a very friendly, family orientated site. In fact, moderators constantly work to make sure offensive or inappropriate posts don’t end up on the pages. This past weekend, a group of Crappie.com enthusiasts gathered at Toledo Bend. Ed made the long, 13-hour drive down to the event and they had a great time, but the weather was horrific. The photo here shows what many of the fishermen met when they got here! Needless to say, there were plenty of filets for a fish fry anyway and quite a few fishing stories. 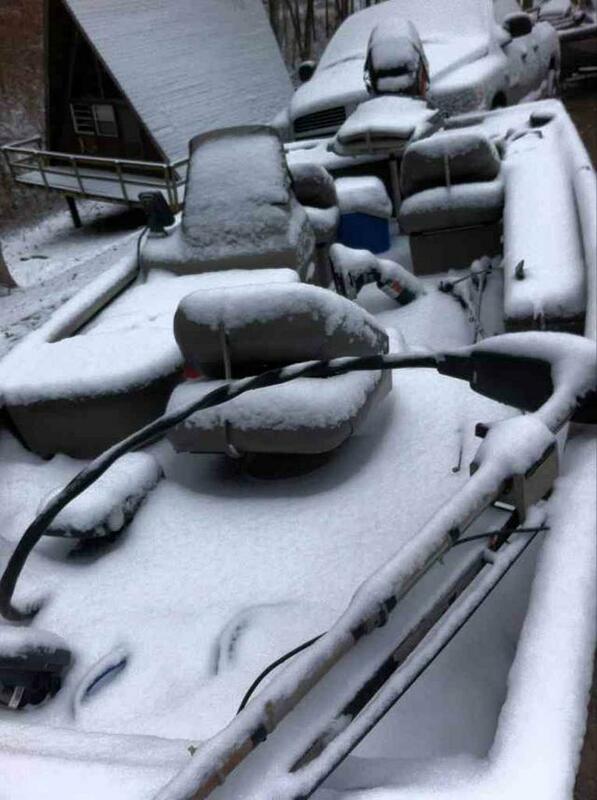 The snow and ice actually kept some of the fishermen from making the trip as bridges and roads were closed in this unusual winter weather for Louisiana. (You will see in the notes below, Ed would like to make all of this, but it is impossible!). 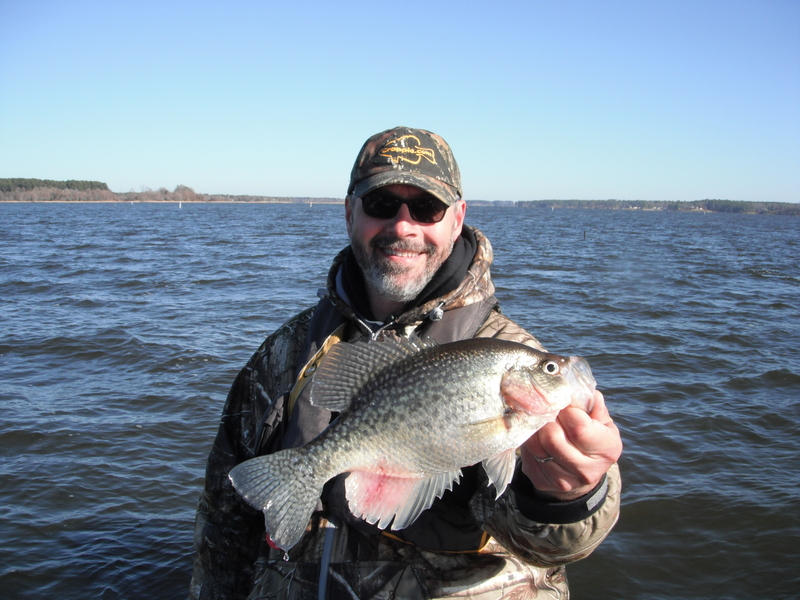 Ed did manage to catch one Toledo Bend crappie this weekend, and we share that photo with you below. And we finish our series on Crappie.com and Ed with few short bites from a recent interview with Ed. I hope you enjoy. Ed with his lone Toledo Bend crappie from this past weekend! Question: What’s your favorite thing about crappie.com? Answer: “I have always loved fishing ever since I was a kid, but fishing for Crappie, has truly become my passion. Crappie fishermen seem to be the friendliest and most generous people there are. It amazes me all the good things they will do for each other. I see it all the time on Crappie.com. It makes me very proud to be able to help enable this. Kinny, thanks for the interview. I can relate to Ed because we both come from IT backgrounds. Love crappie.com because it provides great info, and I love fishing for sacalait… uh, white perch. Even though I’m an avid flyrodder and crappie aren’t the easiest to catch on flies. Still living in the Cenla area provides many great crappie waters and enough for our family to enjoy many meals… thanks in part to Ed’s website. Kinny, thanks for the interview… I can relate to Ed because we come from the same background. I love crappie.com as it provides great information, and because crappie is one of my favorite fish. Which is saying a lot because I’m an avid flyrodder and “sacalait” aren’t the easiest to catch on flies. Still, I catch enough for the wife and I to enjoy whenever we want. Living in Cenla, there’s so many great “white perch” waters… and only 2 hours to D’arbonne!